According to a Reuter's article, Israel's Asian restaurants went on a one-day spring roll strike Tuesday to protest the Knesset's new plan to rid their kitchens of foreign chefs. 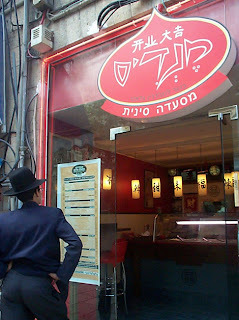 "The restaurants are angry at government plans to purge Japanese, Chinese and Thai eateries of Asian cooks and replace them with Israelis as part of a broader program to cut the number of foreigners working in the Jewish state... Israel attracts virtually no immigrants from Asia since anyone seeking citizenship here must prove they have Jewish family or links to the country." The restaurant owners threatened that sushi and noodles would be the next items off the menu. I would think they would strike hard and "86" the sushi in the beginning since it has become so popular in Israel. But apparently they thought it was best to go with the egg rolls first. Personally, I think they should have taken soup off the menu just so every Asian waiter throughout Israel could say "No soup for you!" Hopefully, a deal will be struck before Israel becomes sushi-free. Jews and Asians should be able to co-exist peacefully. There might be hope because a restaurant once existed in suburban Detroit during the 1980's called "Shanghai Shapiro's," which was half Chinese and half Jewish deli. But then of course, that restaurant did close its doors.